Well, I’ve been hinting about this for a bit, and now I’m very excited to announce the very first EffectsBay.com pedal contest give-away. Hopefully, there will be many, many more in the future. This contest is brought to you by the great people at Fat Tone Guitars. Fat Tone Guitars has donated a pedal to our cause, and it’s pedal that should spark some interest for sure! 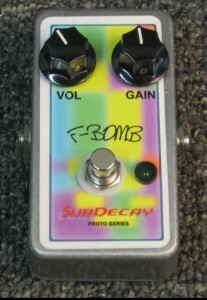 We will be giving away SubDecay F-Bomb fuzz pedal. What’s making this give-away a bit more special, is that it’s a prototype, with a serial number of 001! Normally, the F-Bomb fuzz pedal is in a green enclosure, but this prototype is in a funky rainbow box. This ain’t your old man’s classic rock overdrive. The F-Bomb has more gain than you will ever need. It’s balls to the wall with the drive knob at noon. It’s not “open,” “transparent” or “warm.” The F-Bomb is the antithesis of everything the establishment thinks you should want in a dirt pedal. It’s compressed. It can get sloppy. Turning this thing on is like running naked in to the boardroom and punching “the man” in the face. The “F” is for FET (field effect transistor) but that doesn’t mean some people won’t be offended by it. The F-bomb has 5 FET stages for a huge amount of gain, and a ridiculous high volume output. Play it loud, and when the neighbors start banging on the door you won’t even hear them. The F-Bomb is highly reactive to your guitars volume and tone controls, and you will need to use them to get the most out of this pedal. Even with just two knobs The F-Bomb has a wide range of sounds, from sloppy fuzz, to “chugga chgga” distortion, to basement blues. While we’re on the subject of Fat Tone Guitars, I wanted to let you know a little bit about them! At Fat Tone Guitars, we love guitars, amps and effects. We are always on the lookout for new gear to bring to our customers–gear that sounds great and gear that we know our customers will love. 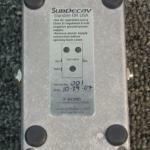 We pride ourselves in having the best selection of guitar and bass effect pedals in the Chicago area and the web. Our lineup of stompboxes includes the best of what’s new and the best of what’s tried and true. We constantly talk with our customers to learn what makes their tone. And we are constantly scouring the web and attending tradeshows to learn about what’s hot. Then we deliver. We also carry a wide array of vintage and pre-owned gear. Check our website often to see what’s arrived. And if you are interested in trading up for some hot new guitar or amp, give us a call as we are always looking to trade. Fat Tone also has a full service department. In additional to setups, we repair electric and acoustic guitars and tube amps–both new and vintage. In addition to repairs, we also perform mods and upgrades on guitars and amps. From pickups to electronics; from tube replacement to cap jobs. So here’s the deal. 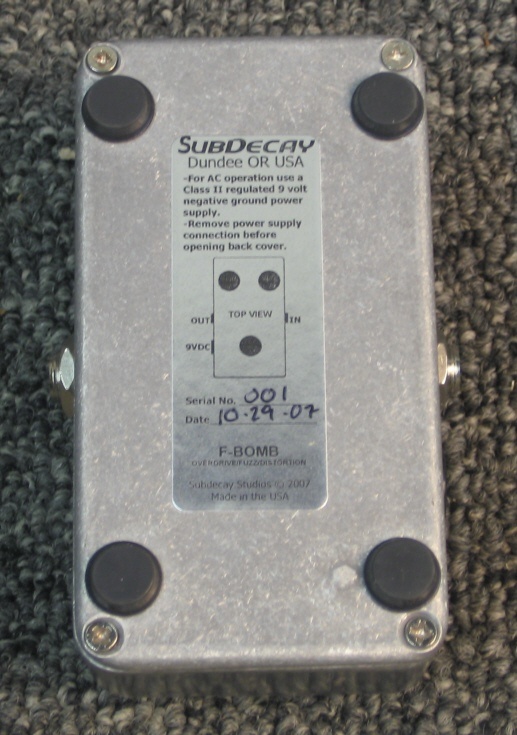 We want to give away a SubDecay F-Bomb Pedal Prototype (the F-Bomb normally sells for $109.00), and this what you have to do. Simply fill the form out below, and answer the question “What is your favorite guitar riff”. It’s as simple as that. The contest will run for 2-weeks starting today. I will pick and announce one random winner on November 25th. You must enter a ‘valid’ email address, bounce back emails will be rejected. Please remember to subscribe to the RSS feed and to follow me on Twitter and/or Facebook to stay informed on the contest. After the winner has been notified and all is good (I’ve retrieved mailing address, etc), Phil from Fat Tone Guitars will ship the F-Bomb directly to the lucky winner! Thanks for the giveaway! I listed it on my sweepstakes site http://lisahassweeps.blogspot.com/. I also promoted it on Facebook and Twitter with a link to Effects Bay and Fat Tone Guitars. Love the rainbow case! 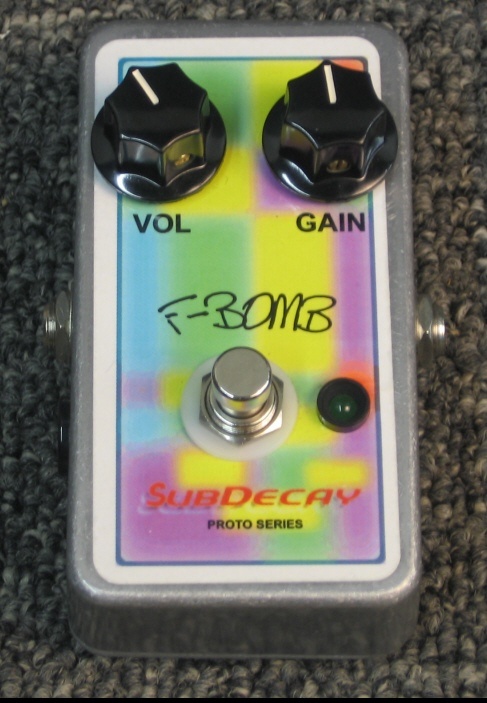 .-= Lisa Sheldon´s last blog ..Win a SubDecay F-Bomb fuzz pedal =-. Fat Tone has a really nice service department for your guitars. Johnny B. Goode is my favorite riff. It was a hit back in the day, and is still a favorite for crowds today.